As part of the Tesco Real Food Challenge, I was asked to interview Suzi Perry. Suzi was absolutely lovely, very chatty and extremely enthusiastic about food, and I could tell from our conversation that she takes great pleasure in cooking for her family and friends. I started off by asking Suzi about her early food memories and she told me that she wasn’t really into food as a child. Her mother was a fantastic cook and she can remember how there would always be an amazing birthday spread, everything home made, including beautifully iced cupcakes and delicate triangle sandwiches. When she was 22, Suzi spent nearly a year in Osaka, Japan, where she acquired a taste for Japanese food, her favourite being noodle based dishes and fish, which she learned how to make along with seaweed sushi. One of the highlights of her week was spending time in the Yakatori Bar eating barbecued chicken. Nowadays, Suzi spends half her time in England working, and the other half in France where she has a home near the Italian border. It is there that she spends her time relaxing in the garden, which is well stocked with fruit trees, including lemon and grapefruit trees. When I asked her which kitchen gadget was her favourite, she replied that it was her juicer, which she uses every day along with the fruit from her garden. Suzi starts her day with a cup of English tea and a newspaper, which her husband brings to her while she’s still in bed, lucky thing! Lunch will often be a Salad Niçoise, made with tuna, anchovies and green beans. Because she’s over here so often, there’s not much that she misses from the UK, but I’ll let you in on a little secret, Suzi always takes some English cat food back home to France for her cat! Sticking to a very healthy diet, Suzi avoids complex carbohydrates and wheat, she doesn’t smoke or drink fizzy drinks but she does do the occasional workout, plus she stretches. Her job keeps her fit as she is always on the move. Fruit, especially bananas, keep her going during filming. Although she doesn’t have a signature dish, Suzi is a big fan of curry. Making a curry from scratch and grinding her own spices gives her “bubbles of pleasure.” When she was young, curry was one of the first things she learned to cook. Her mother had an Indian friend who introduced them to curry and taught them both how to make ‘real’ curries. One of her favourite Indian dishes is chicken jalfrezi, with spinach sag and mushroom rice. Suzi also cooks Thai food, including beef with sweet chilli and cashew nuts, a result of cooking lessons whilst on holiday in Thailand. If she were to cook a romantic meal for her husband it would be a fish dish, maybe some salmon and herbs with soft cheese baked in foil, accompanied with some fragrant lemon rice. I quizzed her on desserts and found out that she recently got an ice cream maker. First up will be tiramisu or lemon meringue ice cream – I’m impressed with her adventurous choices! Suzi also makes a mean gooey chocolate pot and loves panna cotta with fresh fruit on top. Another dessert favourite is banoffee pie; made by her friend it’s the best banoffee pie in the Universe! What would be her dream kitchen appliance? A Fisher and Paykel multi temperature fridge draw! It’s an amazing CoolDrawer that has five different temperature settings, allowing you to store everything from fresh food to frozen food to fine wine at the correct temperature. Yes please, I wouldn’t mind one of those myself! I asked Suzi if she had a favourite celebrity chef and if she ever watched any cooking programmes on television. She replied that she loves James Martin (she used to work with him on the BBC television series Housecall) and enjoys Saturday Kitchen and the Great British Menu. She was asked to do Celebrity Masterchef but had to turn it down due to other commitments. Happiness for Suzi is being at home in France, cooking and pottering in her garden. She has started growing vegetables and even has some chilli peppers on the go! Up to now she hasn’t taken any photos of food, but she does have a Canon SLR and enjoys taking photos of the butterflies in her garden and her cat. When asked to name one of her favourite holiday destinations she said it would have to be South Africa, where she went on her honeymoon. As well as the safari and fabulous food, there is a great wine area – another place to add to my growing list! Suzi Perry has another passion that keeps her busy. She is a patron of Promise Dreams, a charity dedicated to raising money for children who are seriously or terminally ill and provide treatment, help and support for both them and their families. The team at Promise Dreams work together with dedication and enthusiasm to continue making promises and delivering dreams with the support of the corporate sponsors, Promise Friends and fundraisers. 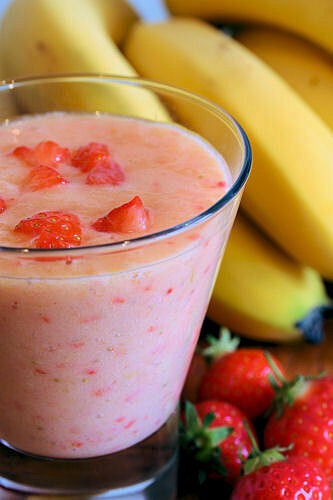 Have a go at making Suzi's Strawberry Smoothie Recipe! 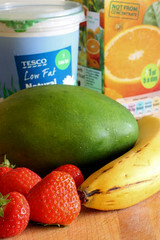 You still have time to enter YOUR recipe in the Tesco Real Food Challenge (until 29th June 2011). Check out the eight Mealtime Moods and share your recipe to match! Eight lucky finalists will be chosen by the Judges to appear on the Real Food Cook Off presented by Matt Dawson and Lisa Faulkner, where they’ll compete in front of a live audience to be crowned Britain’s best Real Food cook. Could that be you? I enjoyed reading this Nic, especially as her family only live less than 100 yards from me. Suzie also went to the same school as my son. Although, true to say, I don't know them. Suzie is often in my local newspaper with Promise Dreams charity events. Thansk for sharing these insights Nic! your blog is very interesting! im following you ! if you want to send me your banner so i can put on my blog, that will be great! Very nice interview. Suzi is so nice.